Gosainkunda is situated at the height of 4360m. It is one of the most famous pilgrimages of Nepal for Hinduism and Buddhism. It is the greatest lake of the 108 lakes in this area. The views of the Himalayas from here are truly amazing on Gosainkunda Trek. Straight north from Kathmandu is the Langtang- Helambu region which enjoys snow-covered peaks, a mild climate. As well as friendly hospitable inhabitant which makes it the ideal trek almost year round. The 1,710 SQ km Langtang National Park hosts a variety of natural splendors, from lush valleys alive with red pandas, snow-leopard, langur monkeys, etc. to towering fir and rhododendron forests gives bursting spring color. The (7,246 m.) Langtang Lirung to the north, Gang Chhenpo (6,388 m.) to the south and Dorje Lhakpa (6,975 m.) to the east dominates the beautiful Langtang valley. This journey also offers you numerous highlights, stunning views of Manaslu, Ganesh Himal, and Annapurna massif. The Tamang and Sherpa people living here, physically and culturally resemble the Tibet inhabitants and also their unique lifestyle. Rich in wildlife, intense forest teaming with wildflowers and many species of wild animals also adds interest on Gosainkunda trek for nature lovers. Helambu, the mid-elevation region to the Park's south, is a study center of Tibetan Buddhism. Lama and Tamang people also maintain a rich cultural heritage. The evidence is ornate with carved wooden windows, lively dance festivals, and skilled weaving traditions. 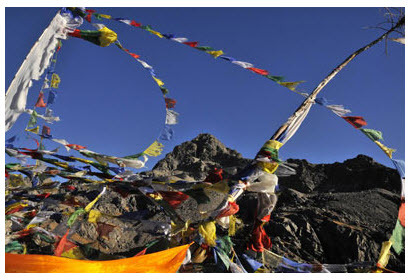 Trekkers can also enjoy these sights on any of the three main trekking routes. Hiking times and overnight stops are also planned for moderate hiking pace, and proper acclimatization to altitude. Treks range in difficulty from moderate to challenging. All trailheads are also accessible by bus or private transports from Kathmandu. Langtang National park entry permit and Trekkers' Information Management System (TIMS) is compulsory for this trek. Day 14: Final departure to Kathmandu airport or further program according to flight schedule.